I ran a practice play on this feast for the semi-finals and it scored a game saving munchdown! Football’s grand and all, but there are only two things that can take the edge off spending up to four straight hours watching men crouching, running, jumping, crouching, running… sweet sweet spandex, and a fabulous plate full of flavours! ***Strip that chicken down, grab a sauce pan and prepare meat according to taco package instructions. Chop all veggies and set aside (keeping green onion for garnish). Grate cheese. 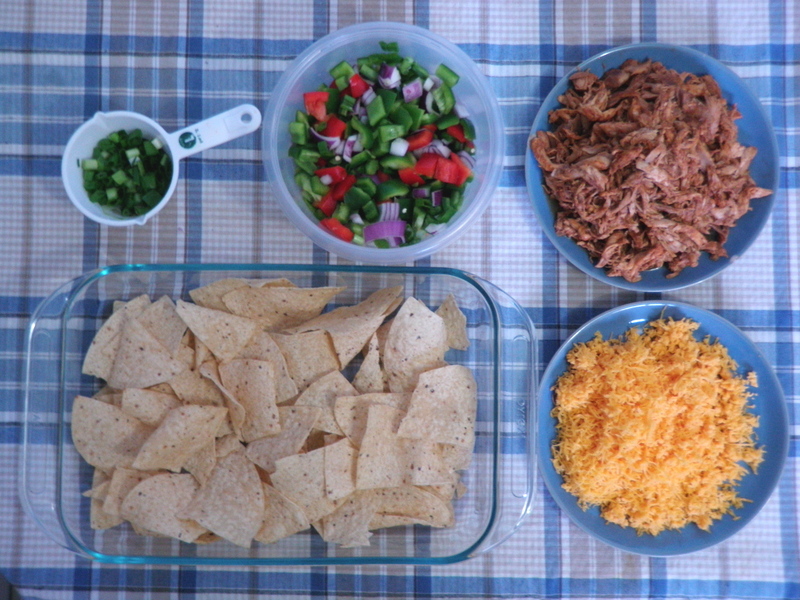 Layer chips, veggies, meat, and cheese in a large casserole dish. Cook in a preheated 400 degree oven for 10 minutes or until cheese is bubbling. 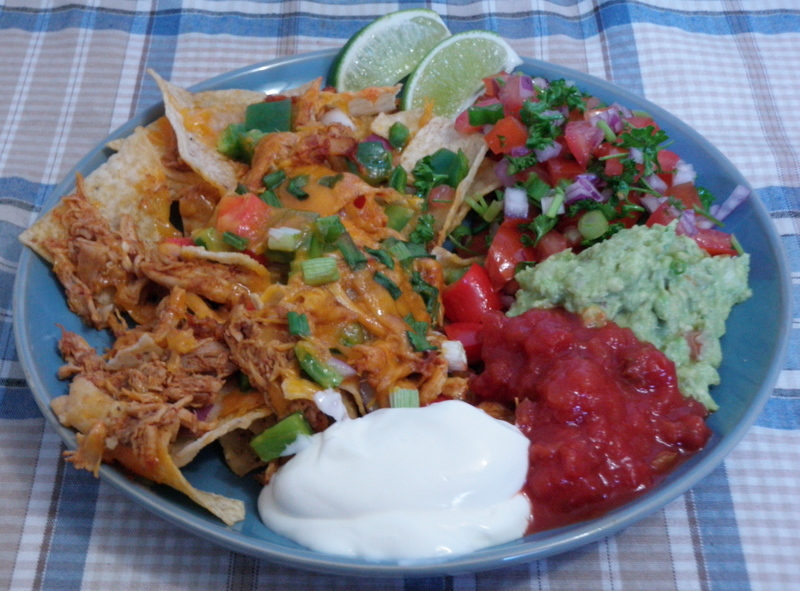 Serve with sour cream and your fave salsa. Munchdown! ***Chop onion and tomatoes, add parsley, a good squeeze of lime juice, and salt. 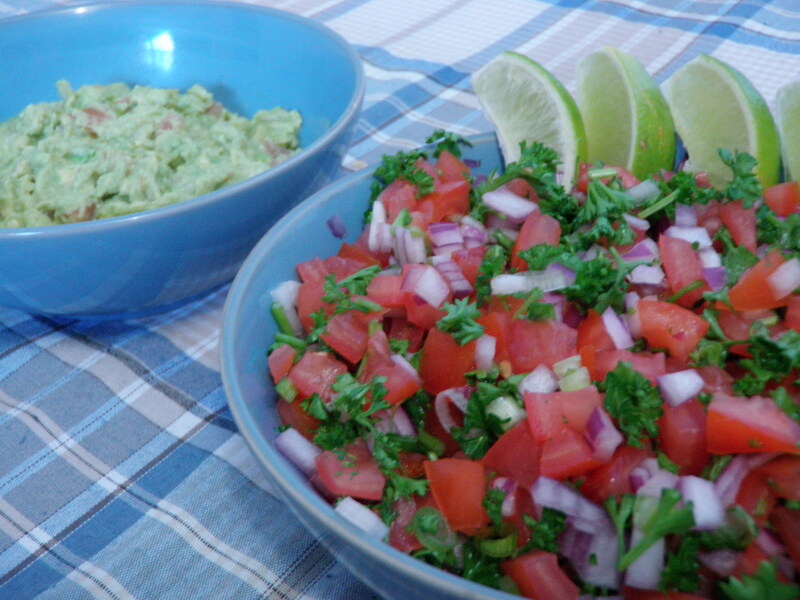 ***Add finely chopped onion and tomato to avocado, squeeze in lime juice and a sprinkle of salt. Post game confession time: While the nachos and pico de gallo are Saving Cymbria originals, I used this excellent recipe to get the guac started (but left out the garlic due to a certain personal trauma). This entry was posted on Friday, February 4th, 2011 at 10:46 am and is filed under Food. You can follow any responses to this entry through the RSS 2.0 feed. You can leave a response, or trackback from your own site.